Deep Narrative: Defining a New Genre - Interdimensional Games Inc. Topics and posts about whatever you wish. Please be civil. Major trolls may be banned without notice! The basic foundations and reward of creating deep narrative games. What is a "deep narrative" game? At its core, it is "story driven" and "choices matter" but it is also more. While "choices matter" often mimic choose-your-own-adventure books, deep narrative uses variables (something only the game medium can achive) to weave multiple previous choices together. For example, if you bring something up in dialog that may not seem very important now, later in the game, a deep narrative will reference those choices and reveal more about the world or story because of it. Had you not choosen that option, you likely would have discovered something else instead. 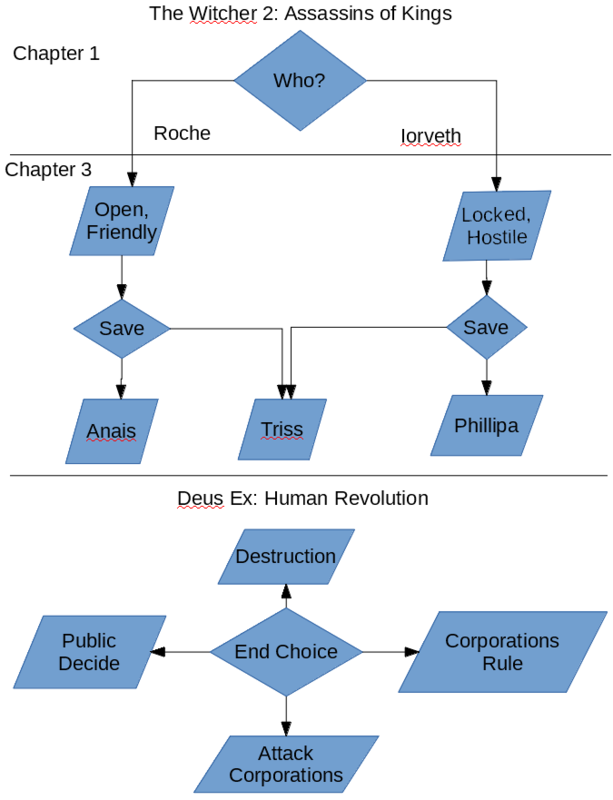 Large swaths of narrative are opened or closed based on choices throughout the entire game. The only way to explore them is to replay the game, often repeatedly. The best AAA example of a deep narrative game in recent memory is The Witcher 2: Assassins of Kings (2011). At the end of the first act, the game forces you to choose Vernon Roche or Iorveth. Depending on your choice hugely changes your perspective throughout the second act: either from the perspective of royalty attempting to gain more territory or from natives trying to defend themselves from them. The knowledge gained from both sides converges to inform the player in the third act. Based on what happened in the second act, options are available or unavailable in the third act. The only way to view both perspectives is to literally replay about 70% of the game. Players that don't miss out on a lot of context at the end of the game. The Anais and Phillipa paths are only available based on the choice you made very early in the game. To see the alternative, you have to replay most of the game. This compared to Deus Ex: Human Revolution (2011) which has a very simple end game choice and reward. The indie game CONSORTIUM (2014) is a deep narrative but, unlike The Witcher 2, it didn't have much in the way of filler: this leads to a game that is relatively short. CONSORTIUM is, however, more layered than Witcher 2 which, to fully explore the narrative web, requires far more play throughs than just two or three. I'm just gonna voice my opinion again that a deep narrative is a quality, and not a genre. Genre defines overall gameplay mechanics, not narrative structure, and no game is effectively advertised based on its narrative, but on its gameplay. My opinion is that Consortium: The Tower is a revival of the type of game the Metroid Prime series was, adding onto it a significantly enhanced amount of story and interactivity. Whereas in that series you stepped into Samus' shoes, we step into the shoes of Bishop Six, and use his variety of mobility and combat tools to jump, fight, talk, and sneak our way through the traps and chaotic puzzles of the tower. The narrative is deep, but that's not the draw. The draw is good gameplay. Genre: "a category of artistic, musical, or literary composition characterized by a particular style, form, or content." C. "no game is effectively advertised based on its narrative"
R. Detective, mystery, sci-fi, fantasy, etc. These are all genres ascribed to works of literature as well as games. People are drawn to specific genres. For example, if I see "sports," I don't pay it any mind. C. "The narrative is deep, but that's not the draw. The draw is good gameplay." R. Imagine Consortium without the narrative, what would you have? Virtual trainer, a firefight, a minigame, and a firefight happening for no apparent reason. That's what, an hour of gameplay? Not even? Most people log 3-5 hours in their first play of the game. That's mostly the narrative, not the gameplay. Narrative is usually what makes people come back for more...unless they're only interested in multiplayer. Narrative is what set Mass Effect apart amongst all the generic, on rails FPS/TPS games that came before it. Narrative is what makes people replay games like The Stanley Parable. Narrative is what makes you regret playing Undertale the way you did. Let me clarify depth: most games that have branching narratives usually lead directly to a reward. For example: take a mission to find a missing person, find said missing person, discover they don't want to be found by the quest giver, and you're given a choice of reward from the quest giver or the missing person. Deep narrative, for example, would take both of these individuals and make them into quest givers for subsequent quests. Working with one gates off the other so in one play through of the game, you can only see one side. An example of this in Consortium is choosing to hear Pawn 64 out or not. The arc to the traitor encounter varies significantly based on that choice. The deeper the narrative, the more content gets gated--the more resistant it is to save scuming. Fascinating discussion and one I am keen to chime in on. I think one of the aspects that drew me to the "Deep Narrative" moniker that Ford invented is the gameworld itself. This is in addition to the points Ford raises about deeply layered choices and consequences throughout the narrative, effectively creating a unique experience for each player. In both CONSORTIUM and Consortium: The Tower, every single thing found in the gameworld has a narrative context. Literally, everything. Zenlil is a sci-fi set with all details worked out in terms of functionality and purpose. The Churchill Tower is also a set, but one that has been heavily modified by construction nanites that have gone haywire. The nanites, turrets, squads, nanite fragments - the entire gameworld and everything found in it ties into and informs the core narrative itself. Other games do this, of course. Most immersive sims do this. The Dishonored series does this. Bioshock did it. Hmm, seems you see "deep" as in everything is thoroughly considered in the game. I see "deep" as it is applied to "deep learning" where there's multiple layers of data processing and each layer identifies a certain aspect of what is being considered. Is reading the book 20,000 Leagues Under the Sea a type of deep narrative? 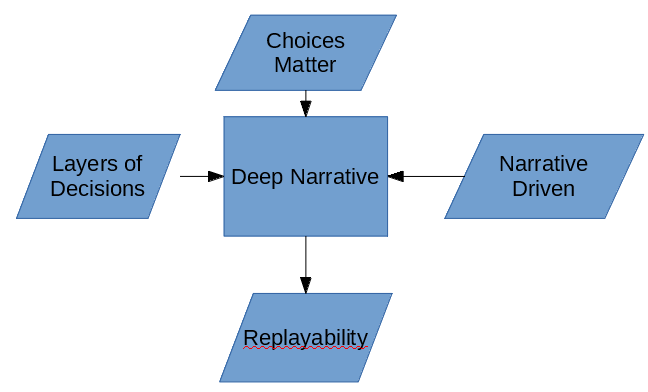 A necessary condition of this "Deep narrative" is to have choices? Name it something else - it sounds misleading. Many games can have a deep narrative but don't have choices. Honestly, looking at what you've put, they look like every Telltale game ever copy and pasted. The issue is semantics - you've seen to have taken it differently than most people do. Different branches of events is nothing new in games: another example would be the Dragon Age series quite easily. These types of games are commonly called "story-driven" and "multiple choice". "Multiple choice" or "choices matter" doesn't distinguish games like Dragon Age from games like Witcher 2 though. I get what you're saying and it's the same point GreatBird raised. "Deep branching," perhaps? Very interesting discussion, guys. I've enjoyed it thoroughly. I love that you took Witcher 2 as the example of deep narative. It was stellar in this regard. Prandy, welcome to the Forum! I just had a thought about this: rather than "Deep Narrative", I'm thinking that instead this should be called simply "Narrative Web". As in, a game with a narrative web, which both Consortium and The Tower do. I believe any game that was truly built on top of a narrative web (as opposed to a largely linear progression of events with a few branches that re-join the main branch) would share something very concrete in common, and could be classified as being within a new genre.